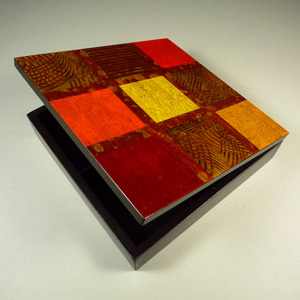 This jewelry box is a work of art... 4 padded compartments lie within for jewelry, watches, and other valuables. But the outside is what makes it really special. Since it's hand painted, each wood box is subtly different and unique. It shows its Brazilian roots with warm, tropical colors! This jewelry box is imported from Brazil. 8.5" x 8.5" x 2"